4 Digit Programmable Ammeter / Voltmeter – DC/AC TRMS. Specially designed and developed with User Programmable Display (Primary CT / Shunt Value). 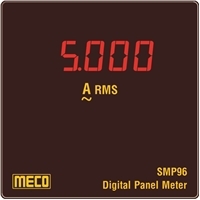 These meters are highly reliable and can give accurate measurements of electrical parameters. Meter is specially designed to be programmed on field as per required CT / Shunt Primary Value by any operator. This feature enables to use the same DPM for different CT and PT. Meter is featured with TRMS technology, still overall cost of meter is affordable.